Wheeling a wooden cart carrying tripods, color charts, and a cooler packed with a rainbow assortment of fresh fruits, Linda Allen steers the tools for the Color and Healthy Food Project through the doors of Peachtree Elementary School in Murphy. Before class begins, Allen and Kathleen Nolte, director of the Cherokee County Arts Council, unpack the cart and arrange the chairs for Kary Ledford’s fourth-grade class to be entertained, educated, but most importantly, motivated to think creatively and seriously about their health and eating habits. Across the nation, throughout the state, and within local communities, dismal reports of childhood obesity are on the rise. “In the area of obesity and nutrition, North Carolina is in serious trouble,” explains Meg Molloy, president and CEO of NC Prevention Partners, a nonprofit dedicated to reducing preventable illnesses, including those attributed to poor nutrition. According to a 2009 report from Trust for America’s Health, 18.6 percent of North Carolina youth are obese, ranking the state 11th in the nation for obesity among youth ages 10 to 17. While Davidson created props and fine-tuned the 45-minute presentation, Nolte sought grants to fund the program. The North Carolina Arts Council awarded the CCAC money for three presentations the inaugural year. In 2011, the arts council took over the program. Now in its third year, and funded in part by a private donor, the lessons will reach eight schools. Davidson has now passed the baton to Linda Allen, a retired nurse who cotaught the classes. Fascinated with Davidson’s approach to drawing relationships between art, science, creativity, and health, Allen hopes to continue striking an effective balance among the disciplines. “A healthy person is a creative person,” she says. After a basic color theory primer, Allen explains to the children how brightly colored foods are loaded with antioxidants. The pigments, such as beta carotene which makes carrots orange, form a natural protection against harmful exposure to pollution, cigarette smoking, and the adverse effects of processed and fried foods. Allen asks the students if they know what some of these ills can cause, and is impressed with their knowledge as they mention everything from wrinkles to cancer. She reveals that the debilitating agents ravaging our cells are called free radicals and antioxidants in fruits and vegetables, such as vitamins C and E and carotene, reduce the impact of free radicals. For a tasty finale, Allen pulls containers of fruit from her cart and prepares a vibrant, fragrant, and tantalizing edible color wheel with watermelon, green grapes, strawberries, peaches, blueberries, and blackberries. Armed with a fresh understanding of nutrition, the children can’t contain their enthusiasm as they devour the healthy treats. It’s just the response Allen hopes for, and one that the kids can take home and share. 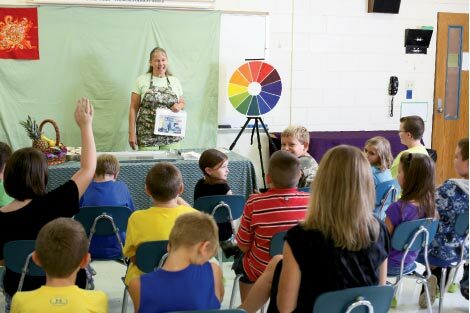 To learn more about the Color and Healthy Food Project and watch a video of the presentation, visit www.cherokeeartscouncil.org/programs.